Echipa AVmall incearca sa mentina acuratetea informatiilor din acesta prezentare. Cu toate acestea, in anumite cazuri, pot aparea mici inadvertente pentru a caror semnalare va suntem recunoscatori. Ne poti contacta oricand pentru a clarifica eventuale nelamuriri. Nu uita sa mentionezi in corespondenta ta numele exact al produsul. Fotografia produsului Amplificator Integrat Yamaha A-S2000 are caracter informativ si poate sa difere de produsul real sau sa contina accesorii neincluse in pachetul standard al produsului. Specificatiile tehnice pot contine erori de operare si pot fi schimbate fara instiintare prealabila de catre producator, neconstituind obligativitate contractuala. Yamaha Introduces a New, Superior Approach to Analogue Amplifier Design. 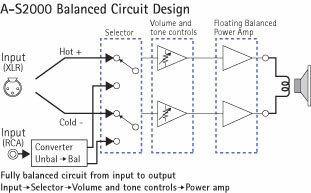 Full Floating and Balanced Circuit Design Achieves for the First Time the Full Potential of Analogue Amplification. Yamaha′s involvement with and passion for music goes back more than a century, to when we built our first reed organ in 1887. Now we are the world′s leading producer of pianos and other musical instruments, and are involved with music in many other ways as well. We manufacture professional recording equipment, we design concert halls and we assist artists at concerts with set up and sound tuning. This knowledge and experience benefits our production of audio components in many ways. Thereafter we were one of the first to offer mass-produced, high quality audio equipment, and introduced many legendary stereo components. We hope you enjoy the genuine HiFi experience of Yamaha Natural Sound. More than forty years have passed since the introduction and widespread adoption of full transistor HiFi audio amps during the 1960s. In the 1970s, high performance, high output PNP-NPN transistors made possible the pure complementary configured power amps that are now the main type of high quality audio amps. In recent years, however, digital amps have become popular for their high conversion efficiency and superior uniformity of operating precision, as well as for their lower weight, size and heat production as compared to analogue amps. 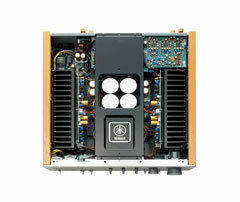 Which leads to the question, which direction will audiophile-level amps take in the future? Generally, two possibilities are considered: continuing to improve the traditional pure complementary configuration analogue amps or working to achieve higher sound quality from digital amps. 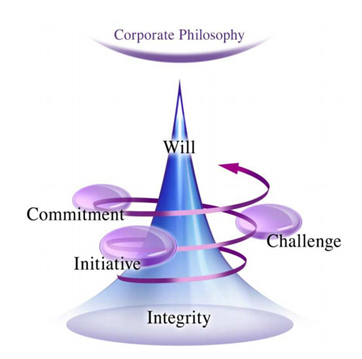 But Yamaha has selected a third approach. (amplification) from the input jack to just before the speaker jack — a capability that has long been the dream of audiophiles. conductors that have equal impedances to ground). amplification method, eliminating the sound quality degradation caused by noise. If it is only partially adopted, however, it will be largely ineffective and may even have negative effects. The A-S2000 is the world′s first integrated amp to offer full-stage balanced transmission, combining high power output with good sound texture and outstanding S/N performance. Its capabilities will be heard to best effect when paired with the CD-S2000 CD player, which employs the same principle. 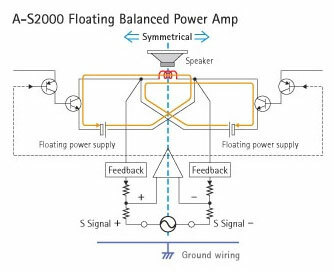 The Floating Balanced Power Amp configuration is completely different from the pure complementary circuit design that has been the mainstream of HiFi amps for nearly forty years. It adopts an output element having identical polarity on the plus and minus sides of the output stage, with both sides having their own power supply and feedback, thereby achieving total symmetry of pullable operation at the output stage. The power supply unit has four floating elements (no restrictive grounding connections), two for each channel, so plus and minus and completely symmetrical. To achieve fully balanced transmission, all audio circuits except for the phono equalizer are balanced. The line amp also uses a balanced configuration for its volume and tone circuits, achieving fully balanced transmission from the XLR balanced input jack to just before the speaker jack. Additionally, the output from the unbalanced RCA input and phono equalizer undergoes balance conversion internally. To ensure ideal fully balanced operation, the volume and tone control systems must be extremely precise. Conventional analogue volume systems suffer from gang error, and cannot achieve sufficient accuracy, even when using high precision parts. 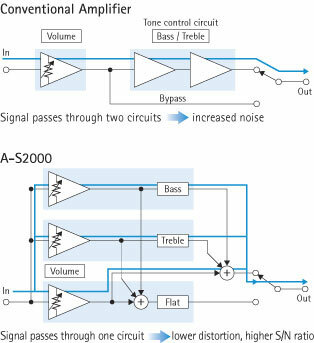 Therefore, for the A-S2000 we developed a unique method: canceling out slight precision differences by the parallel operation of three high sound quality digital volume ICs for each channel and operating the system with an analogue encoder. When using the bass and treble tone controls, each of the three volume elements is applied in succession, and during tone default, three equivalent volume elements for each channel are used for volume adjustment. This ensures the best sound quality during both tone control and default operation. The A-S2000 has four large capacity power supplies for the power amp that are completely isolated from ground. 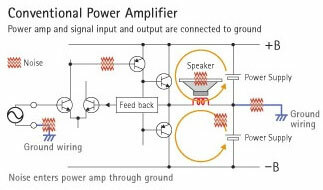 Shunt type local regulators that prevent degradation of sound quality by amperage fluctuation ensure a clean and stable power supply for the preamp. were chosen only after careful evaluation. Completely symmetrical construction with integrated amp left-right separation. The A-S2000 has a completely symmetrical construction intended to achieve the ultimate in integrated amp left-right separation, equal to that of separate amps. A central reinforcing bar ensures that the chassis is rigid and stable. The extra-heavy feet provide a choice of two bases. You can leave the round, flat neodymium magnets in place or remove them to rest the amplifier on four single points. The feet are also height adjustable. They ensure stability on any surface, with superior vibration damping. The fully discrete, high performance headphone amp is compatible with low impedance drive. Its pure and powerful sound quality is best appreciated with high quality headphones. An extremely low-noise phono amp plus a dedicated MC head amp ensure excellent musical clarity and imaging with both MC and MM phono cartridges. Nu sunt recenzii pentru Amplificator Integrat Yamaha A-S2000. Fii primul care scrie una!